Tourists to Phu Quoc Island can enjoy lower tour prices from the second quarter this year as Kien Giang Province and travel firms are joining hands to lower service prices following the island’s connection to the national electricity grid through a submarine cable line. Le Minh Hoang, director of Kien Giang’s Department of Culture, Sports and Tourism, said the department would meet with lodging providers and tour operators to lower room rates and service charges. The new prices are expected to be applicable in the second quarter. Earlier, service prices on the island were high as enterprises had to pay higher electricity and water bills than on the mainland. As power prices are lower now, they should cut service fees to lure more guests, Hoang said. Hoang has yet to announce how much service prices would slide. However, many enterprises said room rates on the island were 30% higher than other in tourist destinations. 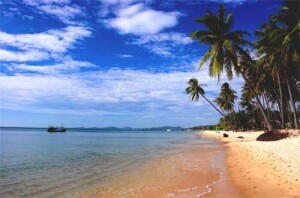 Phu Quoc is facing a hotel room shortage which has also led to higher room tariffs. However, with the island connected to the national power grid and the Government speeding up investment there, local authority expects the hotel shortage to ease soon. There are signs that some investors will start work on their projects after the completion of the 56-km Ha Tien-Phu Quoc sub-sea power line worth VND2.3 trillion. Last week, work started on a five-star hotel project and the investor pledged to complete construction work within 18 months. Some other investors are also preparing to get their projects off the ground, Hoang said. According to data released last August, there were around 170 travel and hotels registered on Phu Quoc, accounting for two-thirds of the total number of projects there. However, only 23 hotel and travel projects have come into service, mainly small and medium hotels with less than 160 rooms each.